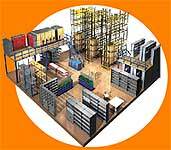 To increase efficiency in your Warehouse and Factory environment, we can provide a variety of storage solutions. A Mezzanine Floor will provide a valuable raised storage area or additional office space. Adjustable Pallet Racking also increases use of space, whilst allowing access to all products. Drive-in Pallet Racking maximizes storage capacity. Shelving of various types and sizes to suit most applications. Lockers will safely store employees' personal belongings in a small space. Work Benches can increase efficiency of production. ensures a cleaner working environment. We offer a free design and quotation service, as a distributor for many leading manufacturers, you have a vast range of products to choose from.